Here is a list of the ten best dividend investing books that should be on your nightstand. These are some great dividend investing books that are worth reading. Did I miss any? Which ones are your favorite dividend investing books? Did I miss the mark? Are some of these duds? I’d love to hear what you think. 1. The Single Best Investment: Creating Wealth with Dividend Growth by Lowell Miller – This witty guide advises readers to stop playing the stock market or listening to television gurus and instead put their money into dividend-paying, moderate-growth companies that offer consistent returns and minimum risk. Citing statistics that show companies initiating and raising dividends at the fastest rate in 30 years, this analysis declares once-stodgy dividends to be “the next new thing” and provides simple rules for choosing the best stocks, using traditional evaluation tools, reinvesting dividends, comparing stocks and bonds, and building a portfolio. Technical aspects of the stock market are explained in the final pages that include two new chapters and revised statistics as well as academic studies, historic back-tests, examples of real-time performance, and a list of resources for further research. 2. Dividend Stocks For Dummies by Lawrence Carrel – Dividend Stocks For Dummies gives you the expert information and advice you need to successfully add dividends to your investment portfolio, revealing how to make the most out of dividend stock investing-no matter the type of market. The book explains the nuts and bolts of dividends, values, and returns. It shows you how to effectively research companies, gauge growth and return, and the best way to manage a dividend portfolio. And, Dividend Stocks For Dummies provides strategies for increasing dividend investments. 3. 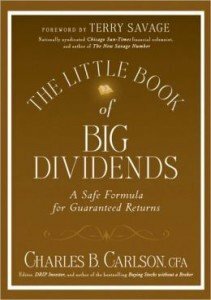 The Little Book of Big Dividends: A Safe Formula for Guaranteed Returns by Charles B. Carlson – In The Little Book of Big Dividends, dividend stock expert Chuck Carlson presents an action plan for dividend-hungry investors. You’ll learn about the pitfalls, how to find the opportunities, and will learn how to construct a portfolio that generates big, safe dividends easily through the BSD (Big, Safe Dividends) formula. If you’re a bit adventurous, Carlson has you covered, and will teach you how to find big, safe dividends in foreign stocks, preferred stocks, ETFs, real estate investment trusts, and more. 4. 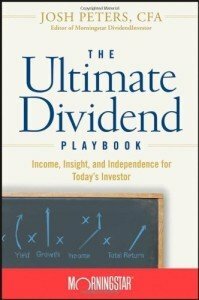 The Ultimate Dividend Playbook: Income, Insight and Independence for Today’s Investor by Josh Peters – Many people believe that the key to success in the stock market is buying low and selling high. But how many investors have the time, talent, and luck to earn consistent returns this way? In The Ultimate Dividend Playbook: Income, Insight, and Independence for Today’s Investor, Josh Peters, editor of the monthly Morningstar DividendInvestor newsletter, shows you why you don’t have to try to beat the market and how you can use dividends to capture the income and growth you seek.